Where does the date on each of my newsletters come from? Can I change it? The date displayed in the navigation bar (or elsewhere, depending on your theme) is the date the newsletter was published. 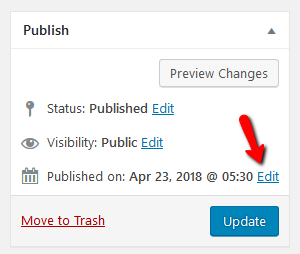 You can change it by updating the publish date of the newsletter. Edit the newsletter and find the Published On field (above the Publish/Update button). Changing this date will update the display. Can I schedule my newsletter to automatically publish on a later date? Yes! Just use WordPress’ built-in post scheduling feature. Can I make changes to a previously published newsletter? Yes! Each newsletter is essentially a website, so it can be updated whenever you want. Just edit it like you would any newsletter. Consider using a free stock photo library to fill in the gaps. Can I duplicate an article? The current version of Buzz does not support article duplication out-of-the-box. However if this is something you require, get in touch with us and we can work something out! Make sure you’re sending the Email View of the newsletter, not the desktop / browser view. Also, you should always send a test email to yourself before sending to your full recipient list. Which email list managers does Buzz support? Currently we have direct support for Campaign Monitor and MailChimp, so you can send directly via those tools without leaving the Buzz administration console. Other software that allows you to create new campaigns via a URL should also work fine. You can reset your password by using the “forgot password” link on the login page. Here’s a guide to the process. I'm an administrator - why can't I reset a user's password? Users may belong to more than one site in the network, so resetting a user’s password would create a certain amount of havoc if all admins could do that at will. Fortunately, it’s easy for a user to reset their own password. Follow the guide here. Can I add more plugins? In general, the answer to this will be “no” but we’ll consider requests on a case by case basis. We have a selection of various popular plugins pre-installed which cover a wide range of functionality from forms, feeds, caching, enhanced editing, galleries and more. The reality is that adding more plugins results in a slower system so while we do try to cater for individual needs, we need to look after the system as a whole as first priority. Check out some of the Add on plugin features currently available. If you’re looking for a fully customised solution, please get in touch. Be sure to explore the rest of this site and use the search feature at the top for specific keywords. If you’re still stuck then you can submit a ticket to our help desk. How do I login to my newsletter?